SONOMA COUNTY, CALIFORNIA – Summer’s here: You and your “horses” need some fresh air and exercise. Sonoma County’s roads are built for horsepower. So, put the top down or open the sunroof. Take time to savor the natural beauty as you cruise along hidden gems like the Pacific Coast Highway, a “foodie freeway,” or a classic Wine Country drive. At almost any given angle, the views in Sonoma County demand attention. Observe neat rows of vineyards stretching over gentle hills, ocean surf pounding against rocky bluffs, or towering giants – coastal redwoods – holding aloft a green canopy that seems to pierce the sky. Here are a few of the spectacular drives in Sonoma County. 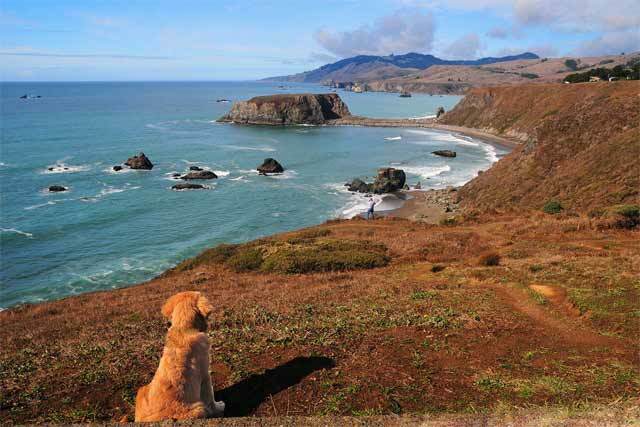 The iconic Highway 1 hugs Pacific coastline through Sonoma County for 50-plus miles. Start at the south end – Bodega Bay and head north to the Gualala River. The winding, dramatic drive is studded with overlooks until you reach Jenner. Then the road gets curvy. The grays, blues, whites, and silvers of the changing ocean and sky give way to the greens of the forest that rise sharply up by the passenger’s side. Stop along the way to wade in a sheltered cove, stretch your legs at a hidden beach, glimpse the distant past, and enjoy the natural beauty. Highway 116 from Sonoma to Jenner takes in the major regions of Sonoma County. Start at Gloria Ferrer and travel through the countryside to Jenner’s River’s End – one of the best sunset spots on the coast. You’ll encounter grapes, cheese, sheep, cows, The Barlow in Sebastopol, a hexagonal plaza (Cotati), some apples, redwoods, a river, and the Pacific. Healdsburg to Lake Sonoma: Enjoy the historic town plaza in Healdsburg, then drive north on Dry Creek Road. Have your designated drivers handy: This premier wine region will entice you to stop for a taste, or two. Finish your drive to Lake Sonoma and be stunned by this beautiful reservoir that supplies drinking water to Sonoma and Marin counties. Valley Ford and Freestone, from Petaluma: Start in Petaluma and drive out to Valley Ford, stop for lunch or a snack at Rocker Oysterfeller’s. Turn inland towards Freestone (stop at Wild Flour Bakery for amazing bread). Continue through Sebastopol and stop for wine and lunch or a snack at Russian River Vineyards. Continue on via Westside Road to Healdsburg. At the end of a long day of “riding,” stop in at a local watering hole and discover a new favorite wine, brew, or cocktail as you nosh on regional delicacies. Have a good night’s rest and hit the “trails” again tomorrow.